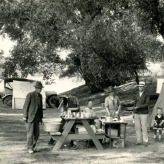 On Tuesday July 3, 2018 the Atascadero Historical Society will be hosting the BBQ in the Park. This event will be held from 5 to 7 pm at the Atascadero Lake Park. Tickets are available at the Colony House museum during open hours, from AHS board members or can be purchased at the Chamber of Commerce. Adults (11yr +) = $14 " = $15 "
Child (10yr -) = $9 " = $10 "